In restorative schools, all young people are helped to understand the purpose and the practice associated with restorative principles. A key principle involves relating to others of different age, ability, gender, race or religion with a sense of unconditional regard. When difficulties arise, it is the difficulty and not the person that is the problem. A sense of partnership is created through the process of building a learning community that is supportive, accountable and respectful. For some pupils there will be an opportunity to become restorative pupil leaders. This is a role that can help to shape expectations in a school community and it will be important that the process of choosing pupil leaders reflects these expectations. Staff will wish to convey the importance of fairness, inclusion, respect for difference, and opportunities for development. Following sessions of information-sharing and discussion, pupils will be invited to apply and they will be involved in a training process that enables them and their trainers to decide collaboratively if they should go forward and take up the role. 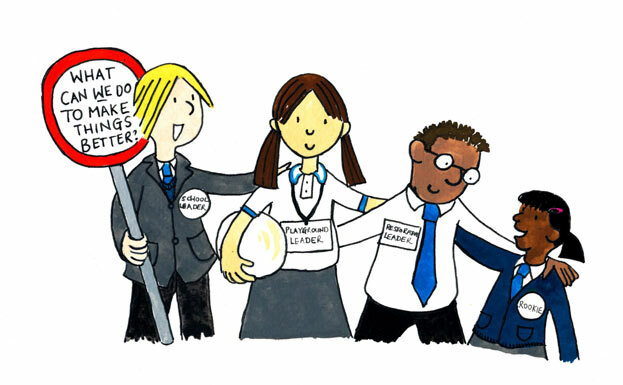 What do Restorative Pupil Leaders give to a school? What do Restorative Pupil Leaders gain from their role? They learn how to build and maintain good relationships which are a key to success and happiness in life. Their experience of acting differently in different situations enables young people to realise they can create learning for themselves and for others. Partnership with Pupils is a commitment to involve all pupils in building a learning environment that is respectful, engaging, participatory and fun. What do young people think about check in and check out circles? I now know the other children in my class better. We all hear what other people think and feel. I find out how people in my class feel, something that I would not have known before. It is a chance to have fun at the start of my day. We understand the feelings of others. If someone is sad or happy we can do something to help them in the day. Finlay: We listen to other people and their problems. I feel like I'm doing the right thing and help them to see they can do that too. Georgia: Being a Restorative Leader helps me to encourage other children to never give up. Samira: I helped a boy who had no-one to play with. Lamar: I stopped a fight between two year 4's. Kym: I enjoyed helping older children interact with younger ones. Depora: I sometimes make sure the younger children are playing safely. Paris: Gabi and I helped a year 4 who said they were being bullied. Hanad: I've learned to listen to younger pupils opinions.